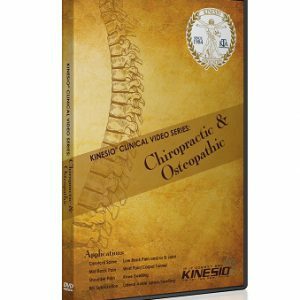 This book is highly recommended for the beginning Kinesio® Taper with limited knowledge of the Kinesio Taping® Method. The Illustrated Kinesio Taping® Manual covers the essentials and gives you a step-by-step approach to the Kinesio Taping® Method. With strong illustrated examples of the muscles and joints to be taped, it provides the reader with a detailed look at how and where to apply the Kinesio® Tex Tape. The product is not identified as KT Tape. The Kinesio® Taping Method has taken the Rehabilitation and Sports Medicine world by storm. 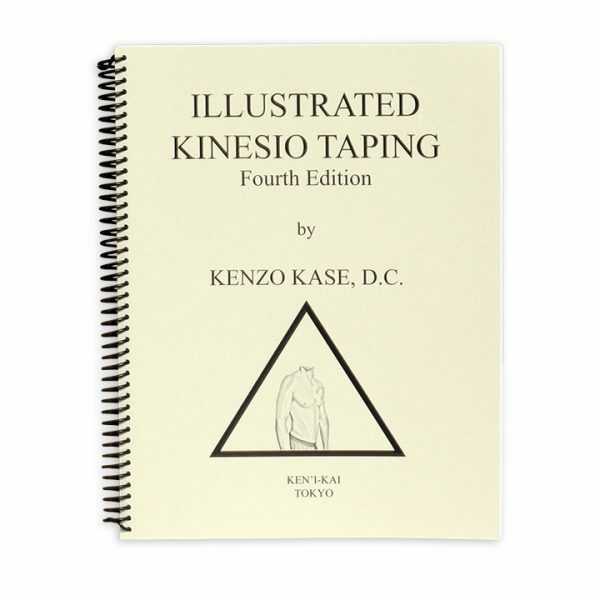 This amazing taping method was developed by Dr. Kenzo Kase over 25 years ago in Japan. Since then, Kinesio® Taping has become the gold, or should we say “platinum,” standard for therapeutic and rehabilitative taping. This proprietary method of taping uses a uniquely designed and patented tape for treatment of muscular disorders and lymphedema reduction, among other things. The Kinesio® Taping Method involves taping over and around muscles in order to assist and give support or to prevent over-contraction. The first technique gives the practitioner the opportunity to give support while still maintaining full range of motion. This enables the individual to participate in his/her normal physical activities with functional assistance. The second technique, which is most commonly used in the acute stage of rehabilitation, helps prevent overuse or over-contraction and helps provide facilitation of lymph flow for an entire 24 hour period. Correctional techniques include mechanical, lymphatic, ligament/tendon, fascia, space and functional. Kinesio® Tex Tape can be used in conjunction with other therapies, including cryotherapy, hydrotherapy, massage therapy and electrical stimulation. Kinesio® Taping affects the activation of the neurological system and the circulatory system. Muscles are not only attributed to the movements of the body, they also control the circulation of venous and lymph flows, body temperature, etc. Therefore, the failure of the muscles to function properly induces various kinds of symptoms. Consequently, more attention was given to the importance of muscle function in order to activate the body’s own healing process. Using an elastic tape, such as Kinesio® Tex Tape, it was discovered that muscles and other tissues could be helped by outside assistance. Kinesio® Taping is an innovative approach to treating nerves, muscles and organs. Since the introduction of Kinesio® Taping in the United States, medical practitioners such as PTs, ATCs, OTs, DCs, MTs and MDs have recognized and embraced this effective, safe and best of all, easy-to-use modality. The method and tape allow the individual to receive the therapeutic benefits 24 hours a day with both comfort and ease because it can be worn for several days per application. 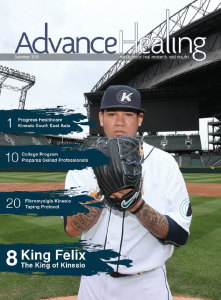 Currently, Kinesio® Taping is used in hospitals, clinics, high schools and by even by professional sports teams. 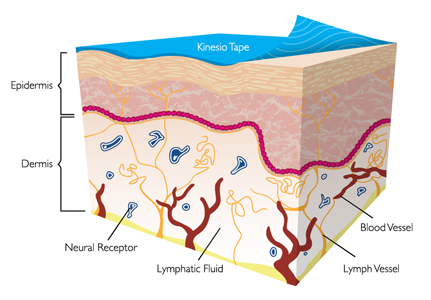 Kinesio® Taping alleviates pain and facilitates lymphatic drainage by microscopically lifting the skin. The taped portion forms convolutions in the skin, thus increasing interstitial space. The result is that pressure and irritation are taken off the neural and sensory receptors, alleviating pain. Pressure is gradually taken off the lymphatic system, allowing it to channel more freely. Caution should be exercised to prevent lateral shearing forces particularly on the elderly or individuals who have systemic illness or sensitive and/or traumatized tissue. Increased unidirectional pull on the skin can cause blistering or micro trauma increasing edema and hemorrhage. In addition, over stimulation of pain and nociceptors of the skin may increase pain or produce itching. Kinesio® Singapore recommends consulting your physician/Certified Kinesio Taping Practitioner prior to the use of Kinesio® Tex Tape. 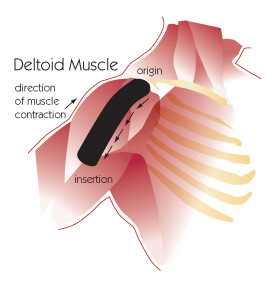 Muscles constantly extend and contract within a normal range. However, when muscles over-extend or over contract, such as when lifting an excessive amount of weight, muscles can not recover and become inflamed. 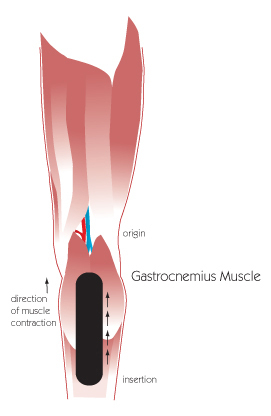 When a muscle is inflamed, swollen or stiff due to fatigue, the space between the skin and muscle is compressed, resulting in constriction to the flow of lymphatic fluid. This compression also applies pressure to the pain receptors beneath the skin, which in turn communicates “discomfort signals” to the brain and emdash. This type of pain is known as myalgia, or muscular pain. Tape can be applied as a single strip “I”, or in the shapes of an “X” or “Y”, depending on the shape and size of the targeted muscle(s). The basic principle of therapeutic taping for weakened muscles is to wrap the tape around the affected muscle(s). 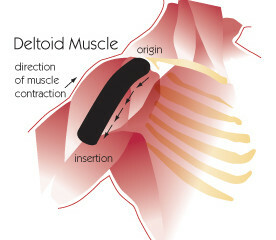 Start from where the muscle begins [ORIGIN], continue along the muscle and finish where the muscle ends [INSERTION]. This particular application process is typically used for supportive purposes. As the muscle fibers contract, Kinesio® Tex Tape supports the contraction by stimulating the skin and pulling the muscle back towards the point of origin. To prevent cramping or over-contraction (overuse of muscles), tape should be applied from [INSERTION] to [ORIGIN]. If you are treating yourself without assistance, it is important to remember the basic principle of stretching the skin before application no matter where the pain is located. For example, if the body-side of the forearm is the source of the pain, you should bend your hand back before applying the tape. Similarly, if the source of pain is the outside of the forearm, then the wrist should be bent forward. This principle must be strictly observed. For treatment of muscle pain, Kinesio® Taping is ineffective unless the skin is stretched. This particular application process is typically used for acute conditions such as strain or sprain, muscle spasm and edema from injury or surgical procedures. As the muscle fibers contract, the Kinesio Tex® Tape will relax the muscle in question. The material presented in this course by Progress Healthcare Pte Ltd is for educational purpose only. This material is not intended to represent the only methods and/or procedures available for the medical conditions discussed, but is only intended to represent an approach, view, statement or opinion of the author or presenter, which may be helpful, or of interest, to other practitioners. The workshop attendees agree to participate in this educational program coordinated by Progress Healthcare Pte Ltd with full knowledge and awareness that they waive any claims they may have against Progress Healthcare Pte Ltd for reliance on any information presented in this educational program. In addition, the attendees also waive any claim they may have against Progress Healthcare Pte Ltd for any injury or other damage which may result in any way from their participation in this education program. Registration fees, less 50% will be refunded if written cancellation is received 30 days prior to the seminar. Upon registration, $50 of the course fees are non-refundable. No refunds will be given before 30 days to course. Kinesio® Taping Association * affiliates reserve the right to cancel at any time with full refund. All incidental expenditure e.g. Hotel Accomodation, Meals, Transport are on attendees own. Hostel accomodation @Jalan Besar area click HERE. Email Progress Healthcare to be on our course mailing list! The Wall Street Journal.. Read on here! Kinesio Taping® developed strong roots in Singapore because many early believers were fixated that a simple thing that is the tape could do such wonders that a patient’s body could feel magical once again. In retrospect, putting way too much emphasis on the tape has heightened the excitement that knowledge of the science behind the evolution and innovation – otherwise known as Kinesio Taping – could bring immense benefits to patients and a medical professional’s career. Like the peak of an ice berg, the tape is usually attributed to patients’ amazing recovery. In actual fact, the other 90% of the ice berg which remains unseen makes the difference between a practitioner and a phenomenal Kinesio Taping Practitioner. Practitioners are often surprised to find out that KT Tapes can be used to aid breathing by simply “lifting” the nose. As other hidden techniques are developed through clinical research and subsequently available through enhanced educational materials… KTA offers evolution and innovation through Basic, Advanced, and Upper Level Courses, information of which will be available soon. The Kinesio Taping® Method has two very important elements: the education and the tool. Kinesio Taping® has never been (and never will be) a one-size fits all philosophy. Knowing how to apply the tape is instrumental in an applications success, and this is highlighted in the globally recognized education and certification program. Today Kinesio University™ approved seminars and courses are offered in more than thirty countries across the globe. In 2014 alone more than 1,000 approved programs were hosted, training tens of thousands of practitioners worldwide. • Describe the concepts of Kinesio Taping. • Review muscular anatomy as it is related to Kinesio Taping. • Explain and Apply the concepts of the Kinesio Taping Method. • Describe the unique qualities of the Kinesio Tex Tape. • Recognize the principles of Kinesio Tex Tape application. • Utilize and demonstrate application skills in guided laboratory sessions. • Demonstrate application skills during lab sessions. • Practice the various cutting techniques and their clinical application. • Apply Kinesio Taping method to relax and stimulate muscles. • Apply Kinesio Taping methods for pain, swelling, joint mobility and stability. • Apply various taping techniques for treatment of unique conditions using the concepts and principals of the Kinesio Taping Method. The Kinesio® Taping Instructor will present material based on an International syllabus, conducted with lab sessions for taping practice. Each participant will receive materials, books, certificate and upon completion of the course access to an online database. The KT1 course is designed to introduce practitioners to the Kinesio Taping® Method. Over the course of this eight-hour class, the Certified Kinesio Taping Instructor (CKTI) will discuss the fundamental concepts of the Kinesio Taping Method and the unique properties and use of Kinesio® Tex Tape. During lab sessions, attendees will have ample time to practice screening and muscle testing created for the enhancement of their Kinesio Taping skills and muscle applications for both the upper and lower body. overuse syndromes, stimulate weak muscles, and decrease pain and swelling. In additionto instruction provided by the CKTI, the attendees will receive the full-color Kinesio Taping KT1 & KT2 Workbook to augment their training. Each attendee will also receive a 60-day membership to the Kinesio Taping Association which includes access to a reference database. The KT2 course builds on material learned in KT1. During this eight-hour class, the CKTI will introduce the six Corrective Techniques (Mechanical, Functional, Space, Fascia, Ligament/Tendon, and Lymphatic) and discuss their application in a variety of clinical conditions. During lab sessions, attendees will have ample time to practice applying these techniques to a variety of upper and lower body conditions. Upon completion of this course, attendees will be able to discuss and apply the Kinesio Taping Method to orthopedic & neurological conditions. Email “Kinesio Taping course” to be included in our mailing list. (Prerequsite, Completion of Approved KT1 And KT2 Courses)The KT3 course combines the Kinesio Taping Method foundational concepts of KT1&KT2 with advanced clinical concepts. The course provides lab time for attendees to practice their skills on the new concepts through a variety of clinical applications. The KT3 course is designed to allow the Certified Kinesio Taping Instructor (CKTI) to cater specific clinical applications to address specific professions. Upon completion of this course and prerequisite KT1&KT2 seminar, attendees will be eligible to request and take the exam to become a Certified Kinesio Taping Practitioner (CKTP®). Note: Students can request to take the exam but will not be eligible to receive a CKTP certificate until they graduate. What is a Certified Kinesio® Taping Practitioner (CKTP) ? The Kinesio Taping Association International takes the CKTP role very seriously. In order to begin the CKTP certification process, your practitioner has taken a minimum of 24 class hours of KT1, KT2 and KT3 seminars, and may have received additional advanced training in a particular area of practice. Certification itself requires the passing of a written examination and practical skills demonstration. Education provides the intellectual underpinning – the software, if you will – that makes Kinesio Taping effective. It is the skill and enthusiasm of our trained CKTPs that has made Kinesio Taping a worldwide phenomenon. The curriculum reflects more than 25 years of symposiums, forums and professional sharing among tens of thousands of professionals worldwide. In earning and maintaining CKTP status, your practitioner demonstrates a commitment to the highest standards of patient care. With an ever growing foundation of health professionals desiring and willing to become certified in the Kinesio Taping Method, The Kinesio Taping Association (KTA) has designed a certification process that will allow dedicated practitioners to earn their designation as a Certified Kinesio Taping Practitioner (CKTP). Attend and complete KTA approved KT1, KT2, and KT3 level courses. All Exams are Handled Online. Once The Kinesio Taping Association has received the information needed, you will then receive via email instructors for taking the online exam. If you fail to receive a passing grade of 80% or above, you must request a retake. This is not automatic. Your 1 free retake will only be available 30 days from the time your email is received. NOTE As of January 2011, the KTAI has introduced a CKTP certification mark license agreement which will be a requirement to be recognised as a CKTP. As part of this agreement, membership to the KTAI, at any level is required. You may add the designation of CKTP to your business card and letterhead. Be eligible to assist at approved Kinesio Taping Seminars as a lab assistant. Please email salesprogress.com.sg with your full contact information. You are eligible to apply to become a Certified Kinesio Taping Instructor (CKTI) when the Instructor Training program is offered (typically in cycles of 3 – 6 years). Only CKTPs can become CKTIs. Option of being recognized and listed by name and location on the Kinesio website for patient referral. (CKTP Elite Membership is Required). Ability to submit case studies / research for International KT symposiums. Ability to submit articles of interest to quarterly publication Advance Healing. Become a CKTP from Kinesio on Vimeo. Insist on the original Kinesio Taping and know why it is the best.. The Kinesio® Taping Association team is a select group of medical and administrative professionals dedicated to advancing the art and science of the Kinesio Taping Method through education, clinical practice, research and the support of community service activities. These individuals hold a collective mission and vision about the future role of the Kinesio Taping Method as a central force in the health of patients and client systems, both nationally and globally. Our overall objective is to provide every medical practitioner with the most current application technique through the continuation and improvement of expert instruction and state-of-the-art database tutorials and to properly disseminate health data in support of the Kinesio Taping Method, while maintaining the highest level of professionalism within the company. Specialist Clinics armed with the knowledge of trained and updated Kinesio Taping professionals are most capable to treat you with the magic that is the Kinesio Taping Method. Patients are encouraged to seek professionals who have received the Kinesio Taping certification after 2011 for best results..
Johnson Ponraj graduated with a Bachelor degree in Occupational Therapy from K.M.C.H College of Occupational Therapy, India, 2004. 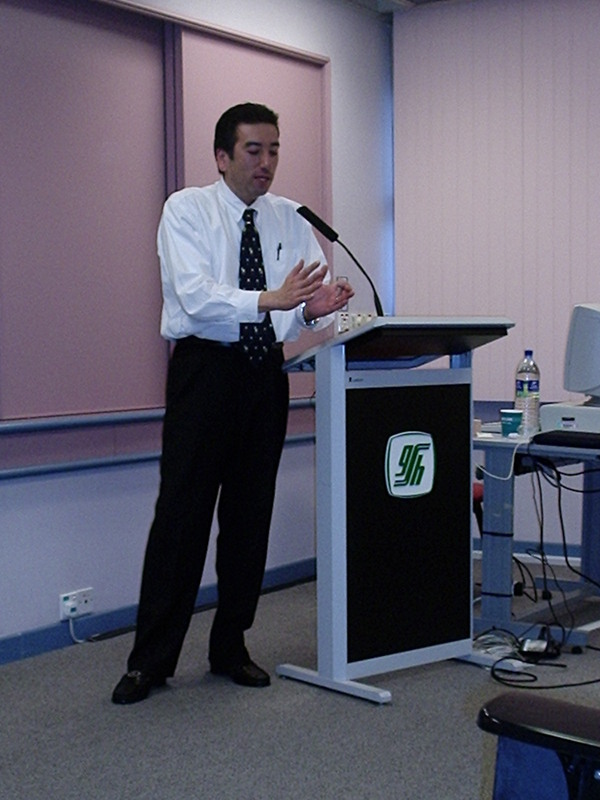 He is a fully registered Occupational Therapist under AHPC, Singapore and a member of AOTI, Ireland. 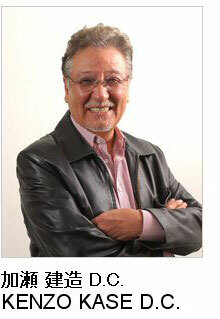 He has been a practising clinician since 2005. He started work as an Occupational Therapy team coordinator at Rashmika Centre for Learning (Aided by Madras Dyslexia Association) in India for about two years. 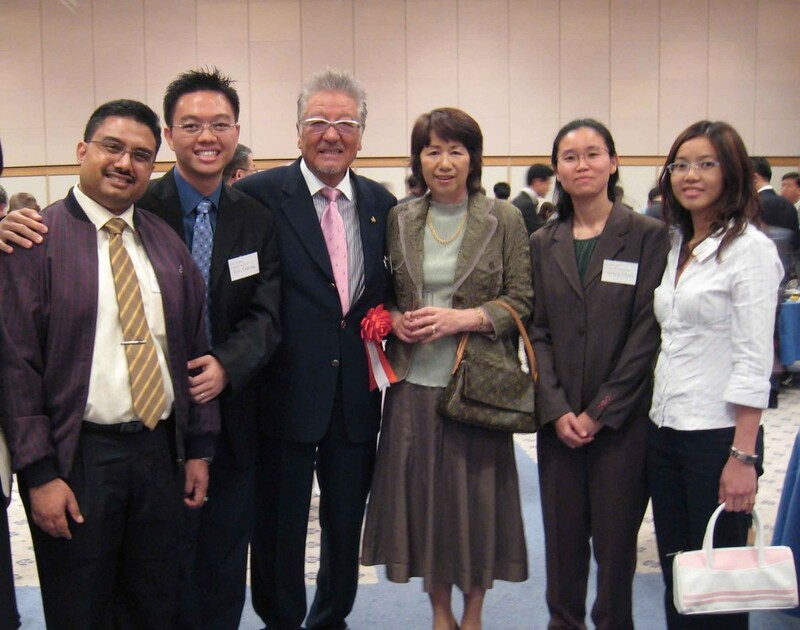 He moved to Singapore in 2006 to work as an Occupational Therapist in various settings that included Early Intervention Programs for Children with developmental disabilities, Program for Children with Multiple Handicaps, and Therapy Outreach Program in Community. He entered private practice as a Trainer and Consultant in 2012 and co-founded Hope Springs Therapy Centre in 2014 and continues to serve clients from all walks of life. Johnson is a Certified Kinesio Taping Instructor (CKTI) , Certified Neuro-Developmental (Bobath) Therapist and a Registered Listening Program provider. He treats clients of all age groups. His beliefs in interdisciplinary approaches has made him pursue intensive clinical credentials in Sensory Integration Intervention, Advanced Sensory Processing intervention, Craniosacral Therapy, Myofascial Release, Soft Tissue and Joint Mobilisation Techniques. His experience working with multidisciplinary teams has made him a trans-disciplinary clinician keen in exploring various alternative therapy interventions.